Which is the Accommodation Contract? The thing that says where you'll be living (hall and room), contract dates, total rent etc. If you go to your accom offer, there's a link to a printable version of the accom contract, as you need it to get your keys. Ohhh that one, yeah. Thanks mate. Do you guys have a timetable of events for the welcome week? You department should have sent you a list of any departmental events during freshers week and the other events are listed in a freshers week booklet that the uni should have sent you in a welcome pack. If they didn't, you can pick up a copy of the booklet from the union, you can also get a list of events on the union's website. It makes such a change from Cornwall, where gigs are either non-existant, extremely difficult to get to, or prohibitvely expensive. I've not done the essentials form either I don't have access to a printer and.forgot about it ! 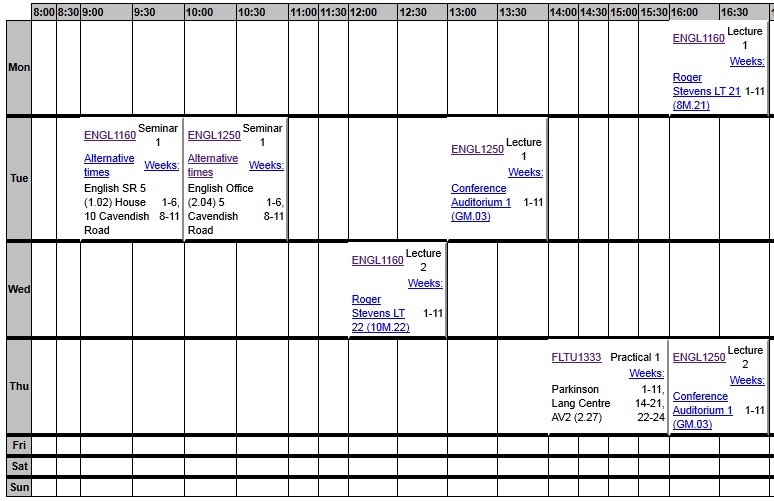 Also it says I have a clashon my timetable but I can't see one ? Oh dear, I don't know how I overlooked that one. Do you think I should take the form to the uni instead of sending it off tomorrow? At least we're in the same house! But I think we're on different floors. I'm in room 72. Nice to meet you though. I had the very same problem. The more I packed the more stuff there was to pack. Didnt think I'd get it all into my car lol. I'm now here at the Leodis residences but im the only one n my flat rather lonely and spent the majority of yesterday unpacking and getting my room all sorted. Ok so maybe a bit late to be askng this sice I'm leaving in a couple of hours, but where do we actually go when we get there? Do we just go straight to our halls? You go to the accommodation reception with your contract and essential information to get your keys you'll also need ID. Well at least they asked me for some when I went to go get my keys.